Winter fishing has finally arrived in Key West. It took quite a while this year for the water temps to drop but now it has and the reef has come alive. The ballyhoo have moved from the back country out to the reef edge. The yellowtail are always happy to see us but the mutton snapper and grouper have settled in under the large schools of ballyhoo. The cero mackerel sky rocketing ballyhoo on the reef are always fun, great to eat and a blast on light tackle. Use a light piece of wire and drift back a ballyhoo for fun action. The Kingfish are settled in on the reef edge and bar edge as well. The best way to fish for them is light wire and a live bait. You can chum the kings to the surface with pilchards and chum. A blue runner is also a great kingfish bait. If you don’t have live bait, they will respond to trolled ballyhoo as well. You’ll know when you hook a nice kingfish or king mackerel when you hear the line start screaming off the reel. They have blazing fast speed and are just fun to fight. Just a little further off the reef edge the Sailfish have shown up to feast before their spring migration. They will be in depths of 20 feet to 250 as a rule. When they are up on top of the reef chasing ballyhoo the only thing the sails are going to after bait wise is a live ballyhoo. 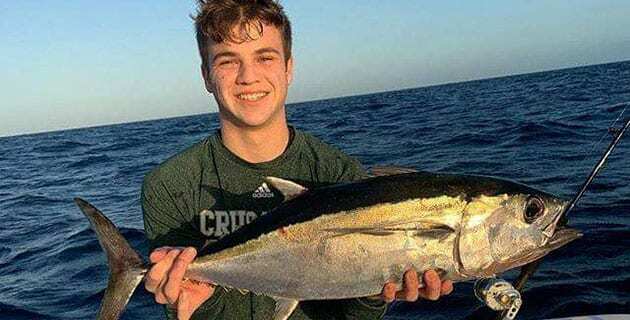 The early morning and late afternoon is still filled with blackfin tuna bites. Several of the wrecks are holding schools of blackfin and they respond well to chumming with pilchards. Make sure you are using small hooks and light fluorocarbon leaders. The wahoos are around but tend only to like to feed on the calm days in 150 to 350 feet of water. The inshore reefs this time of year fill with ballyhoo cero mackerel and snappers. When the wind blows, the patch reefs inside Hawks channel are filled with action. It is a calm place to hide from the wind with great fishing action. Mutton snapper, yellowtail and grouper are common catches on the patch reefs. The sharks are also happy to steal a bait. The backcountry or flats have shifted from tarpon bonefish and permit to more of its winter species. The big barracudas have filled back into the flats. The barracuda in the flats is a totally different fish than the barracuda offshore. In the flats he runs and jumps and they are just an awesome gamefish for the flats. There are still some tarpon and bonefish and permit but you will need to watch your weather and wind direction for the bite, As the cold fronts push thru the tarpon bonefish and permit will slide off the flats to the deeper water channels and the edges of the flats for the warmer water. When we get the warm south winds the fish will slide back up onto of the flat to feed. The shark fishing in the flats is also a lot of fun in the cooler waters. So as the winter winds blow and the temperatures drop the fishing heats up. Take the time to go have fun and enjoy the different season and go fishing.